Where The three Baltic states of Estonia, Latvia, and Lithuania, plus present-day Belarus, Ukraine, Moldova, and Western Russia. 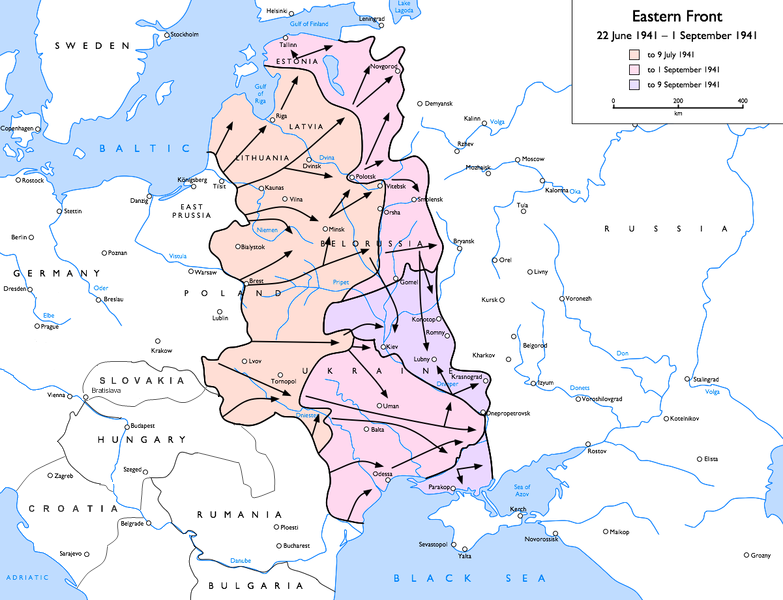 By July 1941, after Finland had joined the German onslaught to the north of Leningrad, the Eastern Front would eventually stretch from the Baltic Sea in the north to the Black Sea in the south, and east to within sight of the spires of Moscow, the Soviet capital. Who Three German Army Groups (North, Center, and South) led respectively my Marshals Wilhelm Ritter von Leeb (1876–1956), Fedor von Bock (1880–1945), and Gerd von Rundstedt (1875–1953) were charged by Adolf Hitler with destroying the Red Army in two months. Assisting the Germans after the initial assault were contingent armies from Italy, Romania, Hungary, Croatia, and Slovakia. In all, there were 3.2 million German and about 500,000 Axis soldiers opposing 2.6 million Soviet soldiers under Western Front commander Gen. Dmitry Pavlov (1897–1941), Northwestern Front commander Col. Gen. Fyodor Isodorovich Kuznetsov (1898–1961), Southwestern Front commander under Col. Gen. Mikhail P. Kirponos (1892–1941), Southern Front commander under Gen. Ivan V. Tiulenev (1892–1978), and Northern Front commander (Leningrad) under Lt. Gen. Markian M. Popov (1902–1969). Why With the publication of Hitler’s Mein Kampf (My Struggle) in 1925 and throughout the 1930s, Hitler was committed to waging an ideological crusade against “Jewish Bolshevism” (Marxism Leninism) and acquiring Lebensraum (“living space,” i.e., land and raw materials) in the East inhabited by Russian and other Slavic Unter­menschen (sub­humans). For his part Soviet dictator Joseph Stalin returned the invective, denouncing Nazi “Fascism” until signing the German-Soviet Non-Aggression Pact (Ribbentrop-Molotov Pact) of August 1939. The Soviets succeeded in mobilizing 5.3 million men aged 23–36, even as the Soviet Northwestern and Western Fronts came unhinged and as German Panzer groups closed in on Leningrad and Moscow, triggering the “great panic of October.” Stalin executed Western Front commander Gen. Dmitry Pavlov and his staff while secretly sending out peace feelers to Berlin and evacuating his government over 500 miles to the east of Moscow, to Kuibyshev (today’s Samara). Even­tually the Soviets mobilized 29 million men. On June 29, 1941, univer­sal military training was introduced for all citizens between 16 and 65. In August 10,000 “Young Communists,” of Komsomol, many of them women, were sent to the front, along with “Peoples Militia” that were recruited from the streets and from factory floors. Outcome Barbarossa was the decisive turning point in the “Great Patriotic War,” arguably the beginning of Germany losing the war. If the Soviet Union survived the German Blitzkrieg, Hitler’s Third Reich would face a two-front war. As it happened, the German onslaught failed in the seas of autumnal mud followed by the freezing tem­pera­tures of an unu­su­ally cold Russian winter. By then the Red Army had recovered its front-line strength of almost 4.2 million men supported by 7,400 aircraft and 4,490 tanks. On November 6, 1941, the anni­versary of the Russian Revolu­tion, Stalin taunted Hitler, saying, “If the Germans want a war of extermination, they shall have one.” A month later the Soviet Western Front attacked German positions and by mid-December was nipping at the heels of the retreating Germans. The Wehrmacht’s reversal, the first of any significance on any front, ignited a growing crisis within Hitler’s high command. Three years from the start of Operation Barba­rossa and two and one-half weeks from the start of Operation Overlord, the Soviets launched Operation Bagration. When Bagra­tion ended in late August 1944, Red Army soldiers had liqui­dated German control over much of the Baltic States, had recap­tured huge parts of their country, and had reached the Vistula River in Poland, the former border that had been secretly agreed to in the Ribbentrop-Molotov Pact. Peering over the Vistula River the Soviets could imagine themselves within striking distance of Hitler’s capital.